Back - Cpl Ray Allen, Cpl Don Wills, ?, Cpl Bill Cave & Cpl Philip Johnson. Front - Jim Coker, Sgt Peter Miles, Sgt Arthur Harris. 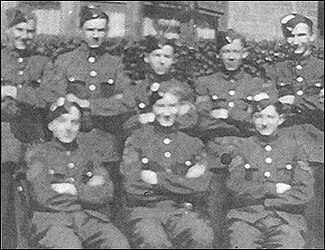 This Squadron used to meet at the Drill Hall in Victoria Road the early 1940s. Don Wills remembers being allowed to stand on the control tower at Chelveston Airbase, waiting for the American B17s to return from daylight missions. The 305th Bombardment Group of the United States American Air Force were based there. Occasionally the ATC members were taken on local flights that were doing checks. A week ago I braved the elements to visit the A.T.C. cadets taking physical training instruction in the Alfred-street School hall. As I passed through the door, I had the illusion of entering a Japanese courtyard where short, stocky figures in vests and slips were practising the Oriental art of ju-jitsu. I stayed long enough to see these cadets practising grips and throws, jumping the horse and doing team rolls and jumps on the mat. They were apt and eager pupils under the clever direction and watchful eye of Sergt. Hartley, an Army P.T. instructor. The Squadron has now taken possession of the new headquarters building in Victoria-road, and the cadets have been very busy helping to get this ex-factory building into habitable condition. The cadets in the Electricians Class have wired up the building for light and power; the cadet mechanics are responsible under their instructors for the fitting-up of the engineering workshop; another party are doing the necessary woodwork under one of the committee, and the Wireless Class will be fitting up their section on pukka R.A.F. plans for practical training simulating as near as possible actual service operational conditions. The walls and partitions give at present a very bare, cold appearance to the room, but much can be done with a few maps, illustrations, etc. I wonder if any of my readers have wall maps not in use, or better still, photographs, wall charts or illustrations of particular interest to boys training for the R.A.F. Recently a Group Captain, the commanding officer of an R.A.F. station, visited the Squadron at work and was so pleased with the progress already made that he extended an invitation to the cadets to visit his station. The first party of 20 have already made the journey and returned full of enthusiasm for everything they saw. Co-operation and regular contact with the R.A.F. at work is the highest stage of A.T.C. training. And do the cadets like it? I ask you! Pilot Officer C. G. Faulkner, of the Rushden A.T.C. Squadron, has been promoted to the rank of Flying Officer. A Labour County Councillor for Rushden, he has been in command of the “Spitfire” Flight since its inception and has taken full control of the Morse and wireless theory instruction for the Rushden and Higham Ferrers cadets. Many gifts of equipment for instructional and recreational purposes have recently been received by the Rushden Squadron, and the officers and cadets are highly appreciative. The most recent parcel contained two sets of boxing gloves from Mr. Harold Fisher, of Irchester, and these will bring great pleasure to Mr. Ernest Partridge and his boxing class, in which physical improvement, eye reaction and speed of movement are developed. Another inter-squadron sports meeting will be promoted by the Rushden Squadron this year, and invitations have been sent to the following squadrons: Kettering (runners-up to Rushden last year), Wellingborough Mannock, Northampton No. 5, Corby, Northampton Town and County School, Wellingborough Grammar School and Oundle School. How the R.A.F. fosters the A.T.C. 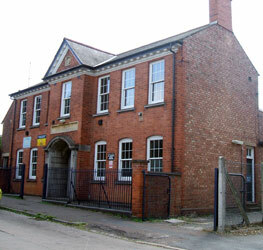 was described by Mr. Sidney Hawkes, Adjutant of the Rushden A.T.C. Squadron, in an address to the Rushden Rotary Club last Friday. Mr. Hawkes suggested that the recent decision to bring the A.T.C. directly under the control of the Air Ministry was proof that the Corps had shown its value and was considered worthy of a place in the home of its older brothers. The alteration in direction had not affected in any way the unique local organisation through civilian committees and instructors and commissioned officers of the R.A.F.V.R. The local committee was responsible for the finances of the squadron and for the provision of premises and training facilities, and beyond that point the rules and regulations were flexible and capable of interpretation to suit local conditions. In some towns the committee met once a quarter and for the remaining 361 days forgot that the local squadron existed. In other towns were committees which by interference or rigid control tied the hands and feet of the commanding officer. The Rushden committee had followed a very happy and progressive centre course, and this was partly due to the co-option of the civilian instructors who from their regular contact with the cadets could give sound advice and guidance. The six officers of the Rushden Squadron had all appeared before an R.A.F. Selection Board, and experience had shown that the commission of an A.T.C. officer was equivalent to that of an R.A.F. serving officer except for the fact that the A.T.C. officer was unpaid and was not posted away from his home town. When visiting R.A.F. aerodromes and training stations the A.T.C. officer was always treated as an equal. Mr. Hawkes said he had just returned from a seven-days course with an operational training unit, where, although the only A.T.C. officer in a mess of 140, he felt immediately that he was welcome and among friends. Nothing was hidden from him, and some of the instructors worked overtime to prepare notes and exercises for the guidance of the Rushden instructors. He spent about two-thirds of his time in the class rooms or at lectures with the air crews, and one-third flying with the trainees and their instructors. This experience gave the A.T.C. officer the finest possible insight into the future training of his own cadets and enabled him to bring a real measure of the practical into the otherwise heavy theoretical training of the A.T.C. Month by month the senior and most advanced Rushden cadets were leaving to enter the service, and new cadets were joining. Without any special effort to boost enrolment the squadron strength remained almost constant at 100 in Rushden and 30 in Raunds. It has been hoped that in due course the N.C.O.’s would be able to take the newcomers in hand, but in practice they found that the N.C.O. was fully occupied with his own advanced syllabus. This threw more work on to the officers, who at a rough estimate worked from 12 to 15 hours a week. The Welfare Organiser averaged about the same and the civilian instructors from three to six hours. Cadets attended two compulsory evening parades of 1½ hours each and two Sunday mornings each month, some also attending one or two evenings each week for additional subjects. There was a local rule that no cadet could join parties visiting R.A.F. stations unless in the previous three months he had attended not less than 75 per cent. of the compulsory parades. A high proportion had qualified for the privilege and had enjoyed flights in Tiger Moths, Blenheims, Lysanders, Stirlings and Halifaxes. Three officers who have served the Rushden A.T.C. Squadron from its inception have tendered their resignation, feeling that younger men should now be appointed. They are the Commanding Officer (Flt. Lt. A. H. Whitton), F/O S. A. Lawrence and F/O O. L. Ash. Flt. Lt. Whitton and F/O Lawrence have promised to stand by the squadron until new appointments are made. F/O/ C. G. Faulkner, the remaining officer of the squadron, with continue to serve.